I have just restored a new style 1926-27 tail light, with a 4 3/8" diameter bright nickel cover plate, covering a single piece, red glass lens. The interior of the tail light housing is painted a reflective white and has two (2) small original single contact, non threaded (straight pin type) bulbs with a small round glass bulb protecting the filament but the numbers on the brass shank have been scratched off so I am unable to read them. The proper bulb I believe would be #63...but each only pushes out 3CP. I think the next size bulb would be a #81...and that pushes out 6CP. The proper description would be a BA15S base, with a 'G6' lamp shape for both...but according to Langs they only offer the #63..which would be their 6-3CP. OH...one more comment. I'm just guessing that the 26/27 'combo' uses the BA15 socket as I'm not aware of Ford ever using anything but...easy enough to figure from what you have, the diameter of the socket will be 15mm if I'm right...and if they shrunk the next size down socket would be a BA9 which measures 9mm across. Seems as though someone was way ahead of the game on the metric system. Don't know it they'll fit but the # 1129 6 vt. single contact bulb is, I believe 21CP. In any case they are quite bright. This bulb is the same size as the 12vt. #1034 or 1157 bulb. 2 bulbs this size fit in the Model A style tail lights I'm using for stop & turn. If it will fit in the 26/27 housing, yup...gain 21CP rating...but does go 2.6 Amp per bulb. George: perhaps I have the CP wrong but the box of 1129's I have are definitely tail (or reverse)lamps. They are certainly brighter than any of the smaller bulbs I have. Probably 63's. It is, of course a question of "will it fit". 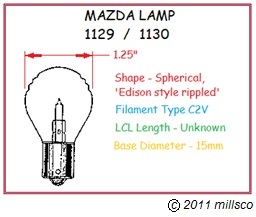 Will 6v LED bulbs fit standard or stop light type 26/27 rear lamp housings? Anybody tried? I restored the same tail/stop lamp last year to put on the Touring. They are both single contacts. This all worked fine for me. As you know you have the two contact socket/thimble but that gets split one for the tail and one for the stop. BTW this lamp is a nice improvement. Just right for the "improved Ford"
Yes Larry, you have the same tail light I have with the double split socket that is the same size as the front light socket (.59"). I assume that the insrument panel light would also be a #63 6-3cp single contact bulb as described by George. They have these at McMaster Carr in boxes of 10 for $5.59, so I think I will be ordering a box today. McMaster-Carr does not have the #1129 6-21 bulbs, but I have a 6-21cp single post stop light from Langs. Your right on the #63 6-3cp is the same. For the spot light I would use the biggest CP I could find in 6 volt. If you could find a 50cp (like a headlight bulb) would be ideal. I looked at Langs and don't find a single like that. Maybe Restoration Supply? A 6 volt halogen would be good for the spot, you are only using it on occasion and not all the time. Have you considered trying your local auto supply? Should be more than bright enough if the reflector is good. I'm saving that info in case I need a new bulb for the spotlight I bought for the speedster. (when I finally get around to assembling all the parts that will be the speedster. We want photos when you get the bulbs in and a report back. Don't have to question yourself. You are probably right that the box you have is actually 1129's. Older more original 1129's at that. Another of my Don Quixote research projects that one of these days I really need to finish...LAMP SPOTTERS GUIDE OF ORIGINAL MODEL T LAMPS. This one is all but done and as with most things Ford, the final two points I wish to include are those windmills!